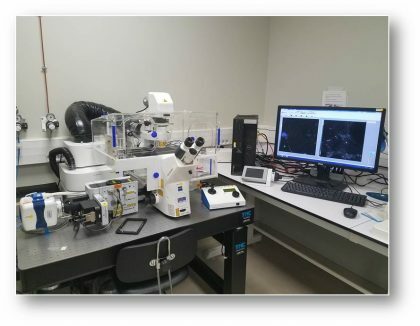 The I-Stem Cellular Imaging platform includes a Photonic Imaging section, consisting of a fleet of 6 microscopes, ranging from the simplest bright field microscope to the very high resolution Confocal microscope. The diversity of equipment allows research teams to have access to different degrees of sophistication for their acquisitions, depending on their needs and the requirements of their scientific studies. The EVOS XL Core is a very simple but efficient Brightfield Microscope with an embedded operating system, with imaging software for image capture and save via mouse or front-mounted manual buttons. It allows to acquire qualitative Phase contrast and stained tissus or cells pictures. The site is equipped with two inverted Zeiss Observer Z1 microscopes, and a straight Zeiss Imager Z1 microscope. 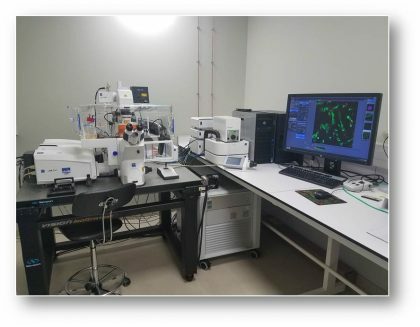 Controlled by Zeiss Zen Blue software, all these microscopes allow to observe and acquire images of fluorescent labellings in standard wavelengths (DAPI, AF488, AF555 and AF647). Some of these microscopes offer the possibility of accessing other wavelengths (see the Specifications for each microscope). The diversity of lenses with various focal lengths also makes it possible to work on different thin supports (slides/blades, thin-bottom culture plates suitable for imaging) or thicker (cell culture plates or flanges). The short focal length and high magnification lenses of this microscope are specially designed for the observation of slide samples or thin-bottomed plates suitable for Imaging. 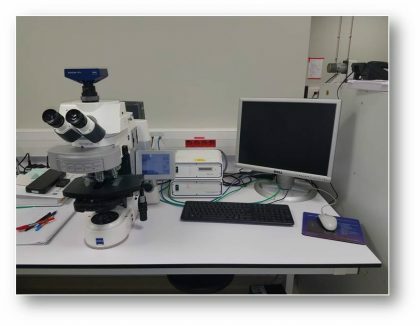 This microscope is equipped with adjustable focal length lenses, and is therefore suitable for observing cellular samples in standard culture flanges or plates. 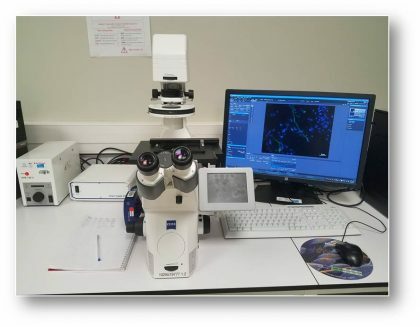 The site also includes a Zeiss Imager Z1 straight microscope, which by its configuration, only allows the observation of samples on slide. This microscope has a larger set of lenses and filters than other epifluorescence microscopes. The spinning Disc is an inverted microscope (based on Zeiss Observer Z1) allowing to get closer to the resolving power of confocal microscopy while keeping the advantage of a fast video acquisition. 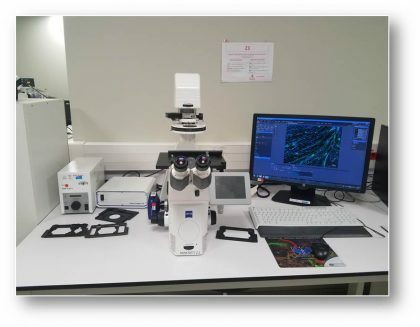 The Zeiss LSM880 microscope is a confocal microscope developed on the basis of the inverted microscope Imager Z1. The Airyscan technology uses a 32-channel zone detector, each operating like a very small pinhole, which makes it possible to capture all of Airy’s tasks. The algorithm that analyses the information from this detector thus makes it possible to obtain a very high light output. It is up to you to decide whether or not you want to use the additional information from your sample to achieve an improved signal-to-noise ratio, resolution or speed. The optional virtual Pinhole mode allows you to decide even after acquisition which pinhole size is best suited for your application and, since each of the 32 detector channels works like a very small pinhole, this technology provides an improved resolution of a factor X1.5 compared to conventional confocal imaging. You then have a lateral resolution of 140 nm and an axial resolution of 400 nm, at 488 nm. In spectral mode (demixing), the LSM 880 allows you to acquire the entire spectrum – and all your markers – in a single scan with 32 channels, 512 x 512 pixels at 5 frames per second.